Juggling is not only good for you, its good for business too! Here is a fun, in your hands, on your feet, out of your seat seminar/workshop. Learn life and business lessons in a fun, interactive way. It is a great method to bring your group together with a challenge. Have you ever tried to juggle? What would it say to you if you could learn to juggle in an hour? How much more could you do in your life if you just opened yourself up to new ideas, new processes and new experiences? 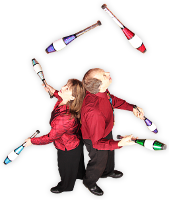 In Capable Hands has taught thousands of people to juggle, all over the world. Steve uses the same methods for teaching that he applied when he was an instructor for Ringling Bros. Circus. Kobi taught circus skills on Nickelodeon TV. How can it NOT be fun? Plop Your Way to Success! Teamwork, Outsourcing and Cooperation are your friends! Recent scientific studies have proven that there is a direct benefit to brain health in the act of learning to toss three juggling balls around. And being able to use both hands equally in a task is great for mental and physical health. Using 3 juggling balls, a feather and some shear scarves, your team-members will discover things about themselves, their work habits and their fellow workers that will last them a lifetime. The Art of Oomph! 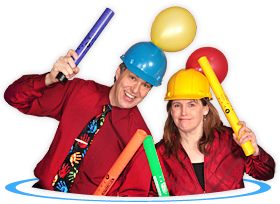 is not a show, but it is a highly entertaining activity that gets your team fired up and ready to take on anything! You’ll laugh, you’ll cheer! And if you’re not careful, you’ll learn something about yourself.